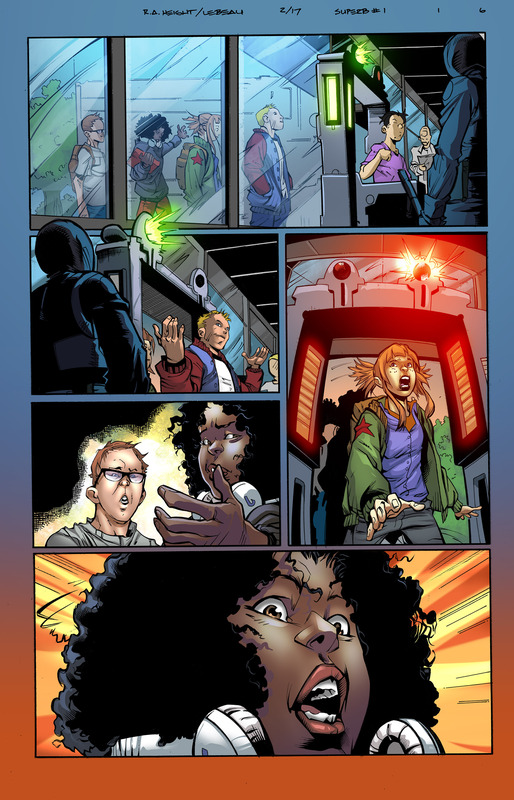 Have a craving for more of Lion Forge’s new Catalyst Prime comics line? Well you’ll be happy to know their third title Superb hits comic stores on 7/19. Fresh off the Catalyst Prime/ Lion Forge writing summit, I got to chat with the Superb writing team of comics veteran David Walker and newcomer Dr. Sheena Howard, about what to expect with this book when it drops. Superb #1, Cover By Ray-Anthony Height, series artist. David Walker: Senior Editor Joe Illidge reached out to me and said that Lion Forge was starting something new, would I be interested, I said maybe. He gave me some of the specifics of what was going on, pitched the basic idea of Superb to me and then said that I’d be working with Sheena on it. Basically those were the two bits that made me say let’s do it. I was especially excited about the character Jonah and just saw the circumstances and the timing were right, so I said yeah. Dr. Sheena Howard: Kind of similar. 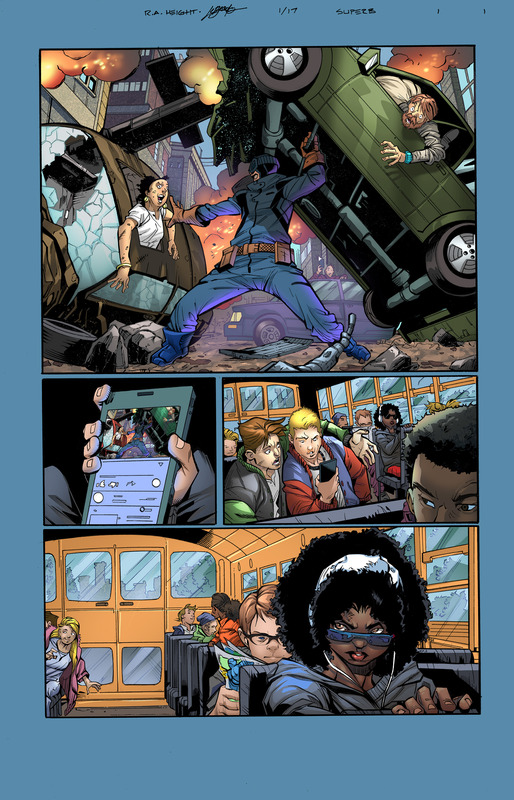 Joe sent me an email saying they were trying to do this new thing with some diverse characters, asked me if I was interested in writing for Superb with David, and I immediately said yes because this is my comic writing debut, so I jumped on that quick. BSF: So far we’ve seen Noble and Accell from the Catalyst Prime launch. What can folks expect from Superb? DW: Lots of excitement. One of the differences between Noble and Accell is that not that we’re doing it as a kid-friendly book, but it’s definitely aimed more at teens, and part of the driving story line behind it is the relationship between Jonah and Kayla. And that’s the foundation we’re building, which I think is a little bit different. There’s a lot more super heroics going on in the other titles and ours is more of a balance between super heroic and the relationship between the characters. Dr.SH: I think the coolest thing about the entire Catalyst Prime Universe is this one event affected these different characters in different ways, so ours is about the two teenagers. For me it’s a coming of age story for the teenagers and how they deal with this major event and how they try to pick the pieces back up after this major event happened. DW: Yeah, Sheena hit it the nail on the head with that coming of age thing, because it’s a huge component of the story that we’re building together. It’s what happens when your childhood best friend and that relationship sort of faded as you become teenagers and then rediscovering that friendship. BSF: Dr. Howard, you come from an academic background, but you’re not a stranger to superhero books, with two books on the subject of comics, one an Eisner winner. What was the, here comes the bad pun, “catalyst” for you to switch writing about comics and being one of the creators? Dr.SH: Well I’ve always wanted to segway into creative writing and more creative projects. I wrote a documentary that premiered in 2016, so I’ve been slowly trying to make that leap to more creative projects. I’ve started blogging and things like that, so I feel like I’ve kind of built up to a place where I could write something more creative, something in the realm of comics. I feel like in that sense I’ve been preparing coming from a cultural, critical perspective looking at comics. I bring a different lens to the project. BSF: Mr. Walker, you’re no stranger to super powered teens. 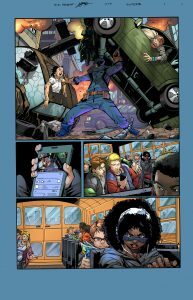 I’m still waiting for book two of your series (Super Justice Force), and you’ve spoken a little about the hook for Superb being not just a superhero book but a coming-of-age book. Why did you feel that was important? DW: Oh yeah, book two will happen, it’s on the bucket list. Part of that goes back to I’ve been reading comic since I was a kid and so many of the comics that I love, primarily Marvel Comics. They had this element where a lot of characters were younger. Peter Parker was young when he became Spider-Man, the Fantastic Four were all pretty young but Johnny Storm was especially young, and all these stories were about learning curves as these characters got special powers. Even as a kid watching the first Star Wars Trilogy, when Luke Skywalker first gets his lightsaber, I think there’s a lot of good material to be mined there. As young people, and by young I don’t necessarily mean age-wise, but people who have yet to venture far from their comfort zone, as they begin to explore the world around them. That’s sort of how we grow up. We leave home in whatever capacity that essence may take on or manifests itself in a variety of ways and I just think there’s no more interesting time then those teen years. When you’re a teenager everything seems so important, it’s your first heartbreak, you feel like it’s going to devastate you and you’ll never survive. Then 23 years later you’re like “wasn’t that cute, I thought I wasn’t going to survive that silly heartbreak”. It’s just a time where we’re learning and our moral compass is beginning to firmly set, that’s just great stuff to explore. Dr.SH: First and foremost I wanted to steer clear of gender misrepresentation. I also have a critical eye for racial misrepresentation, particularly with the black female teenager, I wanted to do her justice to avoid the stereotypes of the normal things we see with black female characters. Even with things around the aesthetic of what she looks like, hairstyle, also the things that she cares about as an individual in the story. I tried to speak to some issues that a young black female teenager might be experiencing, dealing or struggling with. BSF: I think this is the first time you’ve had a co-writer, what’s the collaborative process like with this book? DW: Well actually this is my third co-writing gig and each one is a little different. I’ve worked with Robert Love on a project for Dark Horse several years ag,o and Tim Sealey and I did a project last year. Now with Dr. Howard this project has been us both sitting down, we’ll throw out our ideas for the outline, then filter through our editor Joe, and then it’s been one of us writes a script and then the other one goes over it, then the other one writes a script and then and we just go back and forth working the kinks out of the creative process. There’s kinks, by that I mean like working with an artist and a lot of ways is being a co-writer because as the writer you put down this text, you describe what you want on the page and the artist interprets it. Sometimes it comes out exactly as you what it, sometimes the artist draws whatever they want and then you’re like “oh, I’ve got to go back and rewrite it”. For the most part it takes the writer far less time to rewrite then the artist to redraw, so unless it’s a really egregious error, the responsibility is on the writer to get the words to match what the artist has done. Part of that creative process, no matter what you do with comics, is getting to know the other person and how they work and sometimes it takes a long, long, time, though sometimes it happens pretty quickly. It’s hard to describe what it’s like because if you’re working on multiple titles, you’re working with multiple different people and you’re trying to remember how do I communicate with this person. In some cases, like right now I’m working on a project with an artist who’s from Germany and English isn’t his first language. I don’t need to waste my time trying to make these flowery and overly descriptive because they’re going to be lost in translation. It’s always about getting to know your creative partner, knowing what their needs are, what their dynamics are and trying to move forward as best you can creatively. DrSH: I think the technicalities of the process of how we’ve written the script that David described is right on. For me coming into this as someone who hasn’t written comics before it’s a learning experience, and this is almost like a marriage with me and David. We’re both coming to the table with our ideas and we have to find that balance of fusing those ideas together, seeing what works what doesn’t work. But also as a female in a male-dominated medium there’s that layer as well that I have to contend with at times, as well. I feel like as a female you have to stand up for yourself when certain things go down and hopefully with me writing with David on this comic, it will be kind of an inspiration and motivation for a lot of the women out there writing for a company to move outside of that self-publishing realm, and will hopefully be motivational and inspirational. We definitely have to have a thick skin as a female in this industry. DW: I have to agree 100%. When I look around at the number of women working in the comic industry on the more creative side, whether as writers or artists, that number is painfully low. And then when you go and add women of color, black women, this number is even worse. 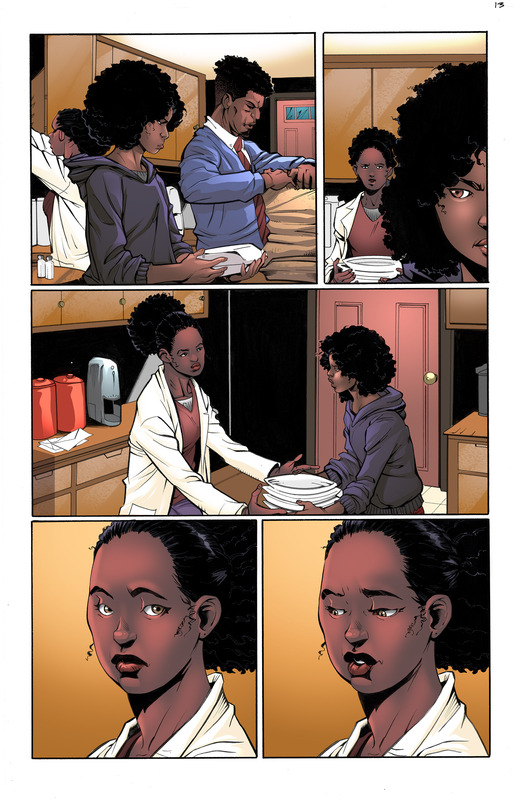 I remember having this conversation about 2-3 years ago, asking how many black women are writing for publishers like Marvel or DC and the answer then was like none at all. Part of me was shocked, but then part of me wasn’t shocked, and then that began a lot of conversations with myself and some friends. How do we make this different? How do we help implement that change? And then talking with some of the creators who’re self-publishers, and reaching out to some of them to see what can I do to help get them into some of these big publishers and a lot of them were sort of resigned to “it’s never going to happen so I don’t even want to bother trying” and that was a really difficult thing to contend with. Some like Spike Trotman, she doesn’t need it, she’s built an empire on her own and is arguably one of the most successful small press publishers in comics right now but there’s a lot out there. I just don’t ever want any young woman, especially a young woman of color, to think she doesn’t have a place in any industry because that’s not the case. I feel like we all have to look out for each other in some capacity. DrSH: Just to add onto that, I feel it’s a bit of a conundrum because these publishers want writers and artists to have experience writing a monthly for a publisher. So if you’re writer and you can’t break into the industry because you don’t have that experience but you’ve been self-publishing to get that experience, but there’s that requirement that they want you to have experience writing with the publisher, how do you get in? And that creates a gatekeeping effect where I have the experience, I have the following, but I still can’t get the opportunity to write for a publishing company. 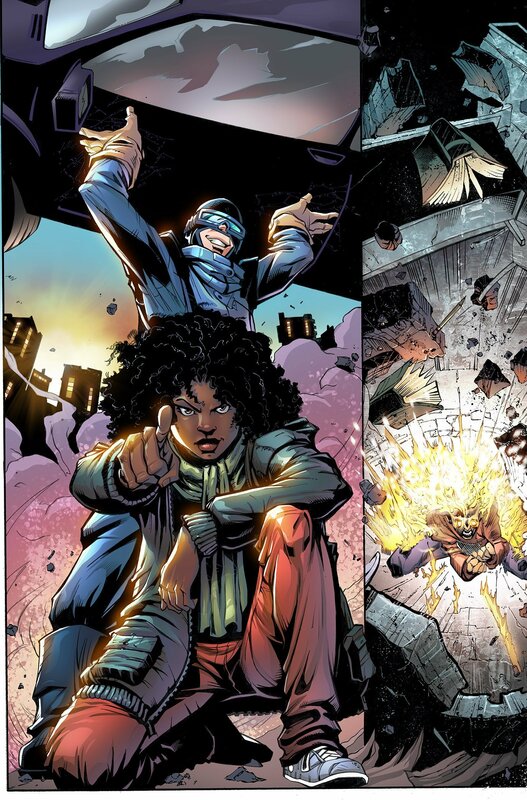 I want to mention that is one of the main reasons in my book the Encyclopedia of Black Comics, I made a concerted effort to include at least 50% of women, Black women in the book, who may not have ever written for a DC or Marvel or Image, but who have followings, who self-publish because they’re out there, they’re qualified black female writers, they just need the chance and opportunity. BSF: I know there was a big LF summit this week, so I’m guessing there’ll be more books down the line, anything you can talk about? DW: Well for me right now it’s just Superb. I’ve said to Joe and Dave Steward, the owner and publisher of Lion Forge, that I’m interested in doing some other stuff, but right now my schedule is just tight right now, even if they offered me something else, I’m swamped. 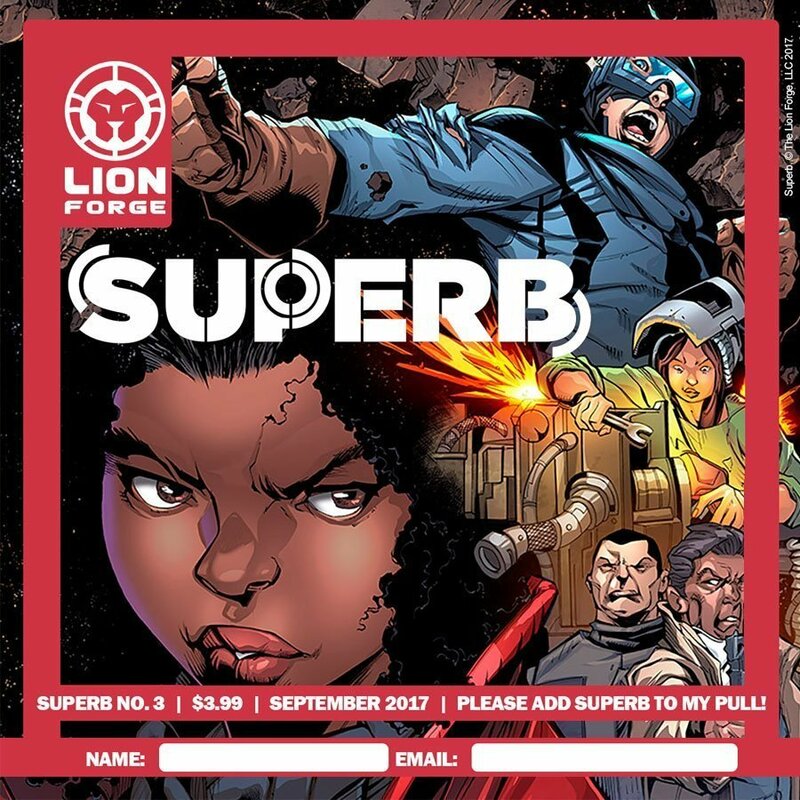 But I really do want to see Lion Forge succeed because a lot of the ideology that drives the company is reflective of some of my personal and political ideology. I’m sure there’ll be something in the near future. DrSH: Yeah, we need people to go out buy the books, ask the people in the comic stores for the book, so that we can have more projects with Lion Forge going forward. So we can continue doing this. 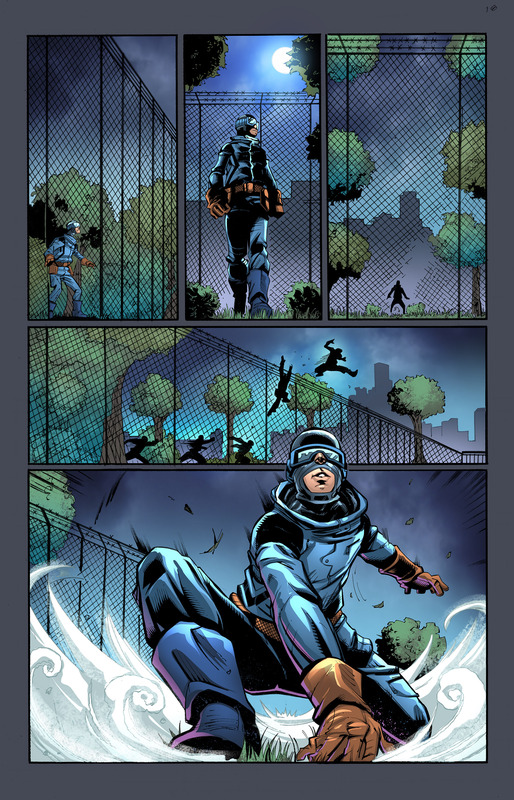 I think if people hang on and stick with us, there going to be some really cool things happening in general in the Catalyst Prime Universe in general, but we need people to demand the book and keep us moving forward. For me I have the Encyclopedia of Black Comics coming out in September. You can follow David Walker on Facebook, Twitter, and Tumblr and Dr. Sheena Howard on Facebook, Twitter, and Instagram. To stay up on the latest from Lion Forges Catalyst Prime Universe follow them on Facebook and Twitter. Superb hits stores Wednesday, July 19th. George Carmona 3rd is an Artist/Writer, former Milestone Media Intern, former DC Comics paper pusher, current book lover, and lifelong comic geek. When he’s not on the train reading, he’s figuring out which comic store is closest for him to cop his CP books. You can find his work at FistFullofArt.com or follow him on twitter at GCarmona3.